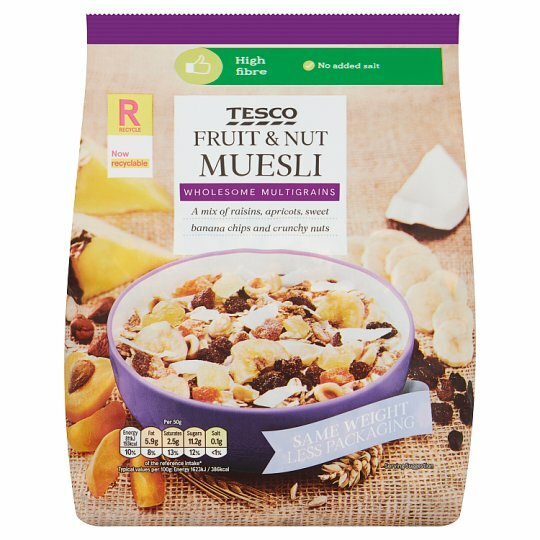 A blend of cereal flakes with mixed dried fruits and hazelnuts. Wholesome Multigrains A mix of raisins, apricots, sweet banana chips and crunchy nuts. We love breakfast. That's why we only work with millers who take pride in what they do and select the most flavourful grains for your cereals like they've been doing for decades. INGREDIENTS: Mixed Fruits (43%) [Sultanas, Raisins, Coconut, Sweetened Dried Banana Chips [Banana, Coconut Oil, Sugar, Flavouring], Dried Apricot [Apricot, Rice Flour, Preservative (Sulphur Dioxide)], Sweetened Dried Pineapple [Pineapple, Sugar, Acidity Regulator (Citric Acid), Preservative (Sulphur Dioxide)]], Oat Flakes, Wheat Flakes, Toasted Wheat Flakes, Barley Flakes, Hazelnuts (4%), Sunflower Seeds. May contain milk. Also, may contain peanuts, other nuts and milk. For allergens, including cereals containing gluten, see ingredients in bold. The allergens in this product have changed.